This is the very first pink chair piece that I painted. It was before I had the revelation that happened in the next one. It was a lovely day and the tide was coming in, making the water glow green over the rocks that were often exposed. This painting was later reworked in the studio, making it more dramatic than initially. It was a foretelling omen, yet I could not see what would be happening. The repainting in the studio would be part of a loosening up of my abilities to compose away from the subject matter,and this has resulted in an ability to produce large dynamic work, like the poppy piece you saw last week. That day, after painting away from the cottage, I decided to paint off of the back deck. But first, I enjoyed the view for a while, sitting in the pink Adirondack chair in the back yard. It matched the shutters of the house. As I rested and, I thought of how much Mom would have loved that chair because of the color. Not thinking much more about it I painted it into the small piece. The chair looked good there, adding a touch of color. Little did I realize that the title I gave it was was foreshadowing what was about to happen. 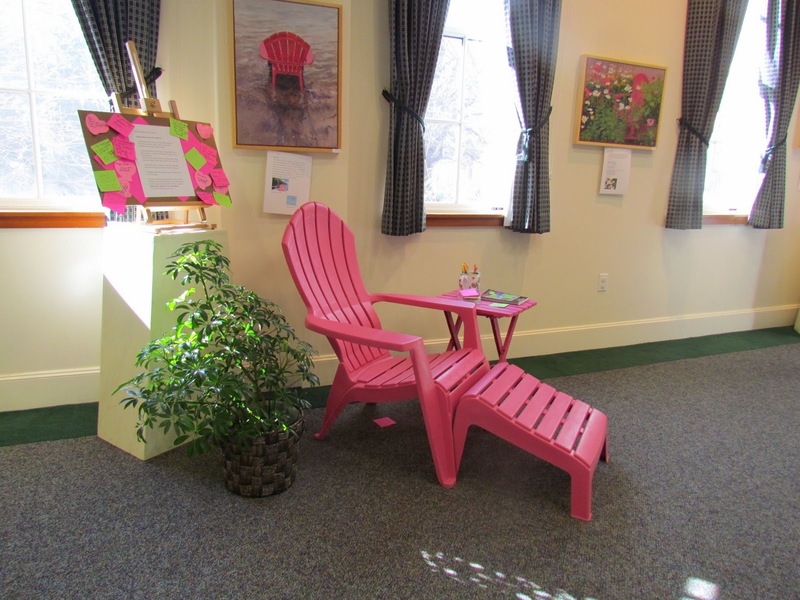 It was, indeed, an incoming tide of art work, all on the pink chair theme, that morphed from a few pieces done as grief work into a glorious celebration of my mother's life. 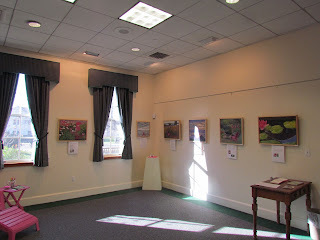 Eighteen pieces of artwork hung in the Topsfield library and brought joy to many people, who responded to the images and the stories. The show will now hang in the Scala Art Center in January, and then travel to the Massachusetts General Hospital Cancer Center. I have not stopped, as there are now three new pieces that will be shown in the January show. The waves continue to lap higher on the shore. The chair itself at the exhibit!